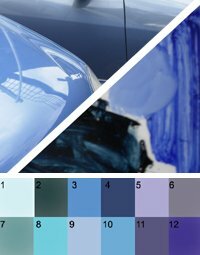 Here I'll tell you about blue paint colors, to help you judge and define different kinds of blue. First, I want to show you some different prismatic (rainbow-color) hues of blue. When you squint your eyes, and look at these four tags through your eyelashes, you see that turquoise is by its own hue the lightest color of blue, and violet is the darkest. You can also say: turquoise is blue, moving towards green - and violet is blue, moving towards magenta. Violet and ultramarine can become radiating, by painting them on a dark-grey or black surface. A light cobalt blue does very nice on a yellow ochre background. Old oil painting masters used a yellow ochre background to paint sunny cobalt blue skies. The blues on the left are shaded turquoises, the ones in the middle come from cobalt blue, and the ones to the right are more violet colors. Blues are about light, and about the way light becomes manifest. Turquoise is the lightest blue, and violet the darkest variety. A funny thing: Ultramarine and violet-blue paint colors can be made light too, by adding white, but they keep their 'dark' character. The impressionists used light violet for shadows, because even a light violet effectively communicates the idea of "darkness". Violet always looks like a dark color, even if you add so much white to it that its just as light as turquoise. Turquoise is much like yellow: it easily becomes smudgy, or too "magenta". In its pure, prismatic form, it communicates the idea of freshess and lots of light, but in its too-dark variety (color 2) its darkness can be pretty intense. It can add an exciting element to your interior paint colors, but on itself it can also look raw, cold and underworld-like. Of all blue paint colors, turquoise is most susceptible to a fall into darkness. cobalt blue is the one in the middle, that's always overlooked. It's the color of a blue sky - hidden by the veil of normality. But it's an extremely healthy color. 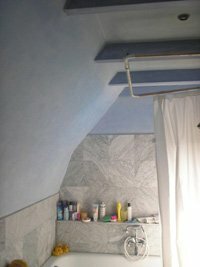 It's one of the few blue paint colors that always look good on a ceiling, communicating the idea of good air. Babies need blue light on their skin, to prevent their bones from malforming (rachitis). And if they get rachitis, they're treated with blue light. Normally, a child gets its blue light by playing outside, under the cobalt blue sky. If you have cobalt blue on your walls, have it rather a bit too light than too dark. You might for example use a blending technique, to let it gradually go darker towards the ceiling. 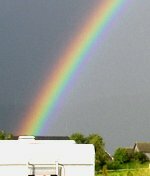 Blues are affected by the presence of other colors. If a light turquoise is put next to a green, it wil adopt a cobalt blue feel, because the green summons up magenta as a contrasting color (and turquoise plus a magenta feel adds up to a cobalt blue look). But next to a red, a turquoise blue paint color wil become poignant and greenish. It's like doing math. But laws and rules are only meant to understand what's going on in your interior designing process. The best thing is: get paint samples, cut them into single pieces, and puzzle with them. Apart from the fact that there are hundreds of shades available: a lot of the other colors in your interior will be warm, which has a big influence on the blue placed in it. The best way to visualize the effect of blues in your own interior design, is working over pictures of your own house with house paint software . I've ordered this software myself too, most of the pics on this website were made in this program. Further: the paint sheen has influence on the way a color looks. A dark blue or violet will be intensified by gloss, but also get highlights and mirror-effects. Turqoise can look great when painted shiny too. But matte paint is best for making the pure color come out. Need a little help in Choosing paint colors? Browse around on this website, for references and knowledge to help you base your decisions on. 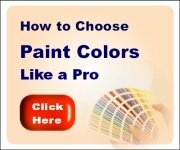 Also check this page on house painting software. For a more step-by-step guide in choosing paint colors, consider using the Paint Color Cheat Sheets. 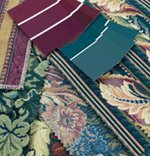 This guide was developed by a color consultant, who works together with a painting contractor (her husband). 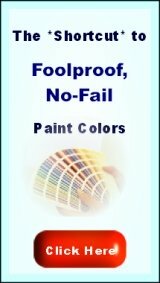 This tool save you a lot of time and money - it speeds up the process of making decisions, and helps to prevent costly mistakes (ordering and painting wrong paint colors). Click here for a review.